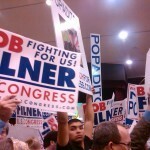 Recently, I was able to lend my support to one of our Iraq War Veterans running for Congress. 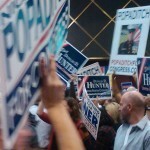 I was honored to be present in San Diego on Tuesday night to support Nick Popaditch (pictures below). As a Marine, Nick was involved in some of the most pivotal tank engagements of the Iraq War, including the push into Iraq and the battle for Fallujah. While a Tank Commander and Gunny Sergeant in the USMC on his third deployment during the battle for Fallujah, Nick received a Silver Star for Valor. The next day he was hit in the head with a rocket. Footage of him attempting to pull himself out of his burning tank, blood streaming down his face was captured by a camera man, and then broadcast around the world. Filmmakers and Major News Networks used Nick’s image to portray the war as a lost cause. They never asked him what he thought. My producing partner from Brothers at War, Norman Powell was inspired by Nick’s courage, integrity, and perseverance and agreed to produce a couple of spots with me. He came up with a second concept based on Nick’s belief in our Chain of Custody, our responsibility to protect the gifts given to us by our fore fathers and pass them down to the next generation. Nick won the Republican Nomination. Then started the race a 50-point underdog against a 9-term incumbent in a district where 70% of the voters were registered democrats. He turned down special interest money, and spoke from his heart, in the process building a strong corps of supporters in his district. The weekend before the election, his opponent Bob Filner, released a commercial that said Nick had not voted in the last 11 years, “does he really care…” Not only had Nick voted, in 2004 he had gone to the polling station, recently back from Iraq, blind in both eyes, and used Braille so that he could vote. Over the course of his campaign in spite of his opponent out spending him by 600%, Nick gained 31 points on his opponent, and finished with 41% of the vote. Even Abraham Lincoln lost his first election. 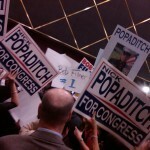 If you think that Nick should run again in the future, go to popaditchforcongress,com and tell him how you feel. It is my hope that we can get Gunny Pop to run again. We need more like him in Leadership positions in our Government. I think he has also a set a wonderful example for our wounded war heroes that their war wounds need not keep them from serving again.